n the name of God, the most kind, most merciful. 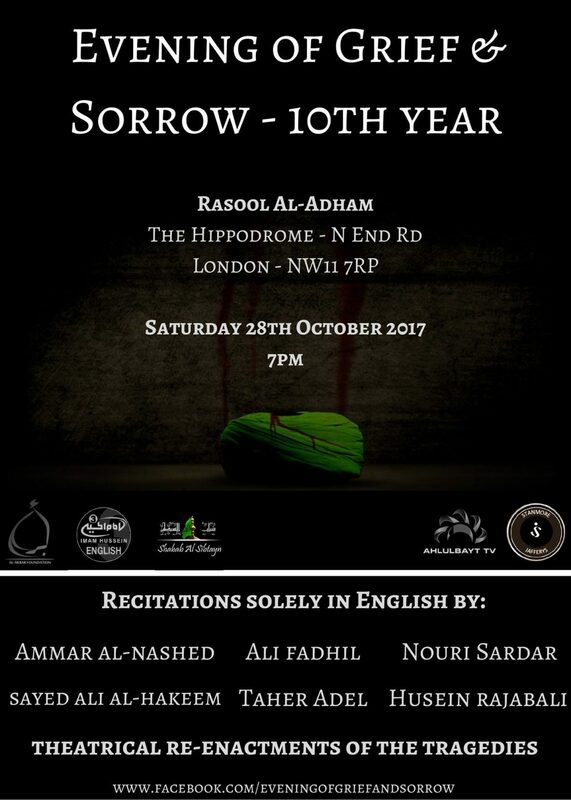 Join us, for the 10th Evening of Grief & Sorrow, the all English Majlis bringing together believers from across the United Kingdom. Where: Hussainiyat Al-Rasool Al-Adham London. The Hippodrome, North End Road, London, NW11 7RP. When: Saturday 28th October 2017 – 7pm. With the assistance of Al-Akbar Foundation | Stanmore Jaffery’s | Shabab Al Sibtayn. Uniting the mourners of the family of the Prophet (PBUH) from across the United Kingdom. For transport details from your city, please get in touch. We swear to you, oh Lady Zahra (pbuy), we will never forget our leader Hussain (as).